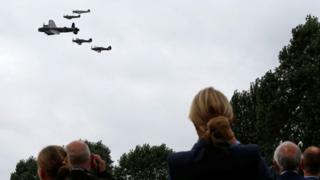 The Battle of Britain Memorial Flight will not feature at the Rhyl Air Show, Denbighshire council has confirmed. The display, featuring Dakota, Spitfire and Hurricane aircraft, was due to fly on Saturday and Sunday at 14:00 BST. The council said the RAF had found a technical fault with a Merlin engine in a Hurricane and had paused flights with those engines for "safety reasons". All other displays are expected to take place as planned, including the Red Arrows. The free event has been arranged by Denbighshire Leisure Services and is supported by Rhyl town council and the RAF.